The capital city of Croatia and as such a natural starting point for explorations of the country. It also offers a few points of dark interest of its own, though nothing that's really major. But it is definitely a cool place to spend a few days in. More background info: Zagreb is by far the largest conurbation in Croatia, with a population of nearly a million. It is also the political and economic hub of the country. In terms of tourism, however, it's a fairly recent discovery on the part of foreign visitors, but over the past few years Zagreb has established itself as a hip destination for city breaks and naturally it also is a good base for excursions further afield. Zagreb's origins date back to Roman times, and by the Middle Ages two distinct city centres had developed, the Kaptol, seat of the region's clergy, and Gradec to the west on a hill, which was mainly the merchant and craftsmen centre. 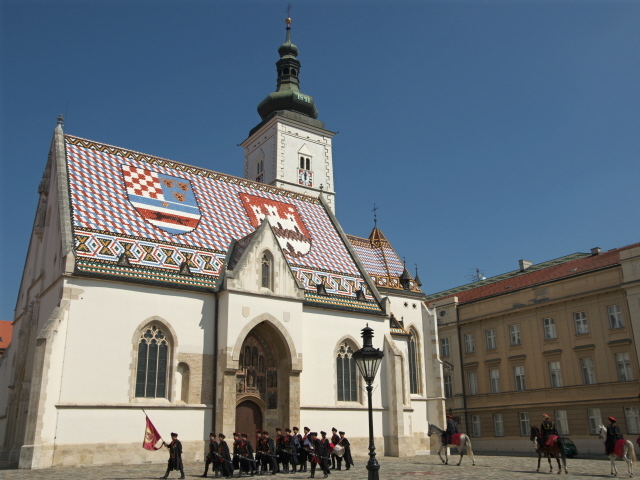 It wasn't until 1851 that both parts were united to become the single city of Zagreb. The division into Kaptol and the “Upper Town” (Gradec) of the old centre of Zagreb is still very visible today, though. Equally visible is the fact that for a long time Zagreb was part of the Austria-Hungary Empire, right until its end in WW1. You can see it in the typical architectural styles of the time that wouldn't be out of place in Vienna, Budapest, Prague or Trieste. This also gives the centre of Zagreb a very different atmosphere to the Balkan cities further south and east such as Belgrade, Skopje or Sofia. In 1880, Zagreb was hit by a 6.3 magnitude earthquake that caused some damage to buildings, including the cathedral, but fortunately did not result in a significant death toll. During WWII, Zagreb was the capital of the so-called Independent State of Croatia (NDH) under the Ustashe Nazi regime, in effect a puppet state subservient to the Third Reich (see under Croatia). 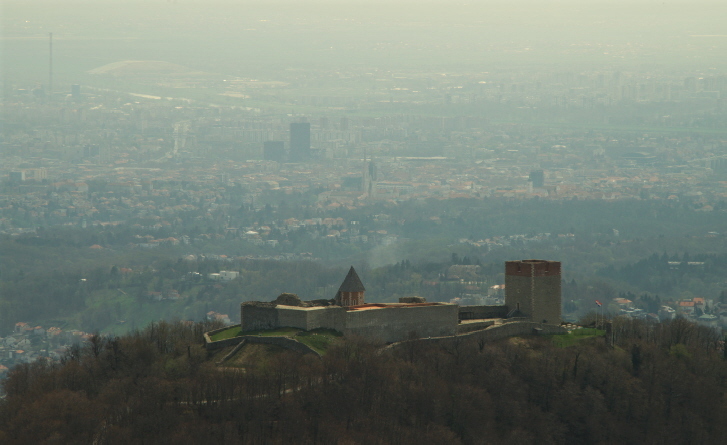 The Ustashe's leader, Ante Pavelić, had a private mansion at the foot of the Medvednica mountain slopes on the northern edge of the city (see Villa Rebar). After WWII, Zagreb became the capital of the Socialist Republic of Croatia, one of the six federal states of Yugoslavia. Zagreb has long been home to Croat Nationalist sentiments, though, and in 1991 when Croatia declared its independence, this came to the fore again, as the old Yugoslavia was beginning to break up. The ensuing War of Croatian Independence (better known as the “Homeland War” within Croatia) affected Zagreb too, twice, in 1991 and 1995 in the deadly form of aerial attacks. The first attack came right at the beginning of the conflict, in October 1991, when Yugoslav Air Force fighter jets (see Željava air base) launched a bombing raid on several targets in Zagreb, in particular the Banski Dvori, the then seat of the President of Croatia (who was in the building at the time but survived unscathed). The second attack on Zagreb came in May 1995, in retaliation for the Croatian military advances in the south. The Serbian Krajina Army used rocket launchers firing cluster bombs into the city centre, i.e. deliberately targeting the civilian population. Seven people were killed and more than 200 injured (see Memorial Centre). Since then Zagreb has enjoyed peace and relative stability. While it is still the economic hub of the country, tourism has joined its principal sources of income. It's still an up-and-coming destination, but word is going round and visitor numbers are increasing. The first I did independently, but the last three of these I visited as part of guided tours by the agency Destination Urban / Swanky-travel (see their sponsored page here). Villa Rebar and Brestovac Hospital were part of a longer tour by minibus that also took in Kerestinec Castle outside Zagreb to the west. The Memorial Centre, in turn, was integrated into a specially tailored walking tour of central Zagreb, but you could also visit it independently. The walking tour wasn't entirely focused on only dark things but also included some of the main general attractions in the Old Town, in both the Kaptol and Gradec parts, the latter including a stop at the cathedral and featuring an unexpected dark detail: the old tower clock that stopped at the minute the earthquake of 1880 (see above) hit Zagreb. It is now mounted to the wall just north of the cathedral entrance. Literally the darkest part of the tour was the Grič Tunnel. 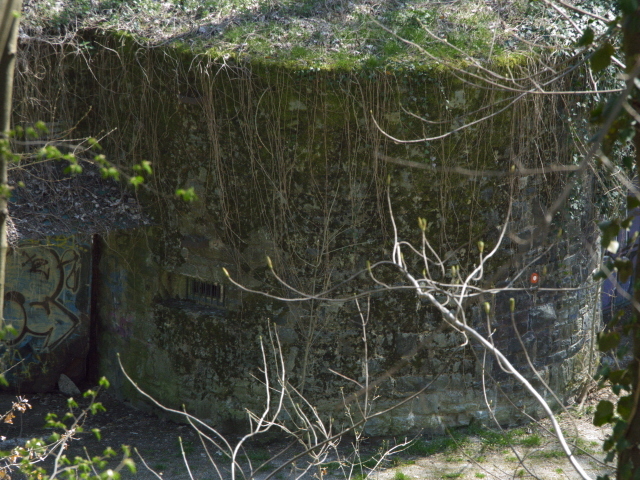 This was originally built during the Ustashe era (see under Croatia) in 1943/44 and intended as an air-raid shelter (though its capacity would have been way too low, providing space to protect no more than some 5000). After WWII the tunnel was briefly used as a warehouse, but soon fell into obscurity, only to be used by squatters and drug users. 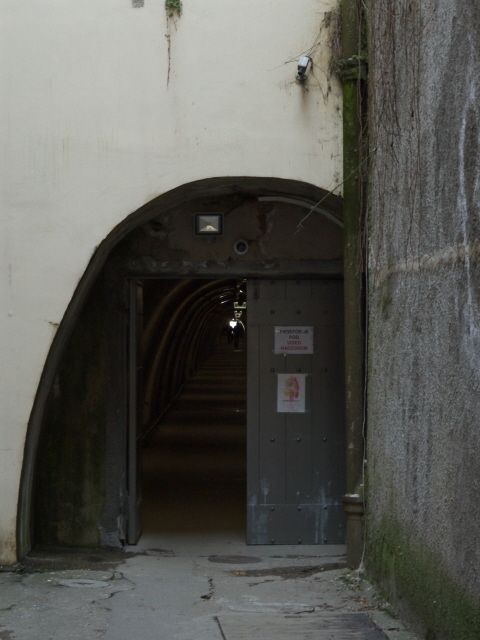 It wasn't until 1993 that the tunnel was “rediscovered”, especially when it was used for a rave party. 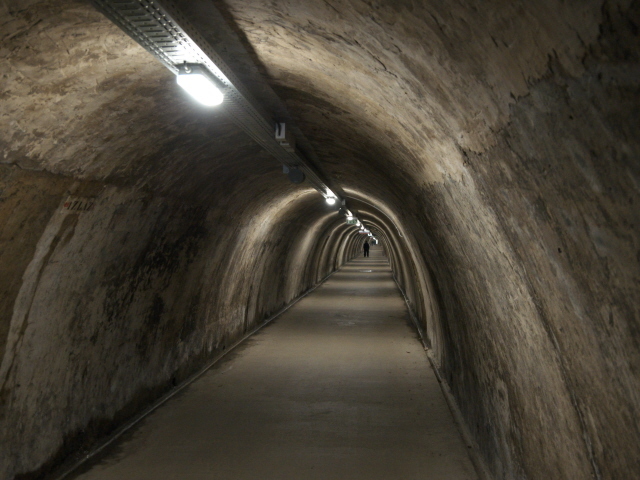 The tunnels also briefly fulfilled their originally intended function, namely providing air-raid shelter during the bomb and rocket attacks on Zagreb in the Homeland War (see above and under Memorial Centre). My guide told me she remembered the tunnels from when they were a destination for urban explorers and full of graffiti. But a renovation plan set up in 2015 and realized in 2016 has turned the tunnels into a clean concrete tube, with just some historic original writings left in place, but no more graffiti. The main tunnel runs west-to-east from Mesnička ul. to Radićeva ul. There are also at least two extra entrances accessed through side tunnels from the south (originally there were three or four such extra access points). We simply proceeded through the full length west-to-east. For the most part the tunnels are fairly narrow, but not oppressively so – you can easily walk upright – but in the middle stretch the tunnel opens up to form a kind of central hall. The tunnels were bare when I was there, but there have been exhibitions inside here too and more are apparently planned, perhaps even some kind of permanent exhibition. For now, the tunnels are open from 9 a.m. to 9 p.m. and entry is free of charge. But that may change in the future. The rest of the tour included the Dolac farmers' market, the old gate between Kaptol and Gradec (with a spiky ball on the rooftop, allegedly to deter witches from flying over on their broomsticks … or so some legend has it), St Mark's church and square in the government quarter, and the Lotrščak Tower with its cannon that blasts a salute every day at 12 noon (but we were too late to witness that). Wandering around Zagreb without a guide I also spotted some other odd sculptures, such as the Petrica Kerempuh group near the market that consists of some brutal depictions of people tied to a pole and one with a noose around his neck. Some classic socialist-realist statuary could also be discovered, e.g. north of Trg Kralja Tomislava, south of the library and facing the art gallery. I also spotted a wall plaque dedicated to the electrical engineering pioneer Nikola Tesla – who is claimed by both Croatia and Serbia as one of their famous sons (though he worked and lived mostly in the USA). The Technical Museum of Zagreb is also named after Tesla. But I didn't go there. One museum I did venture into was the famous Museum of Broken Relationships (open daily from 9 a.m. to 10.30 p.m. in summer and 9 p.m. in winter; 40 HRK). Obviously this has some dark elements as well, especially those cases in which the break-up was not amicable (one exhibit is an axe with which an ex-lover apparently smashed up the ex-partner's place … pretty brutal). 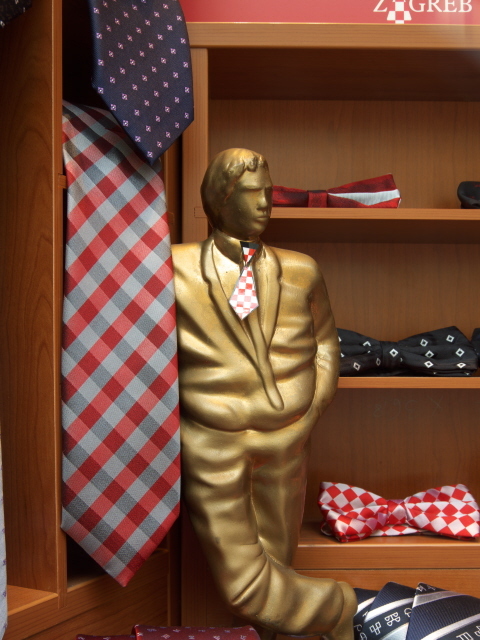 Many other exhibits are more tongue-in-cheek or even romantic. Worth a look. What I didn't find the time to do was popping into the Archaeology Museum. While I'm usually not all that fussed about ancient archaeology, here there would have been one exhibit that would have firmly fallen into the dark category of dead on display, namely the Zagreb Mummy, a genuine mummy dating back to the 3rd century BC, that was brought to Zagreb in the mid-19th century. Apart from the preserved corpse, the cloth it was wrapped in is also of ancient cultural importance as it's inscribed with the longest known text in the mysterious (and as yet untranslated) Etruscan language. The museum is open Tuesdays to Sundays from 10 a.m. to 6 p.m. (to 8 p.m. on Thursdays and only to 1 p.m. on Sundays); admission 30 HRK. 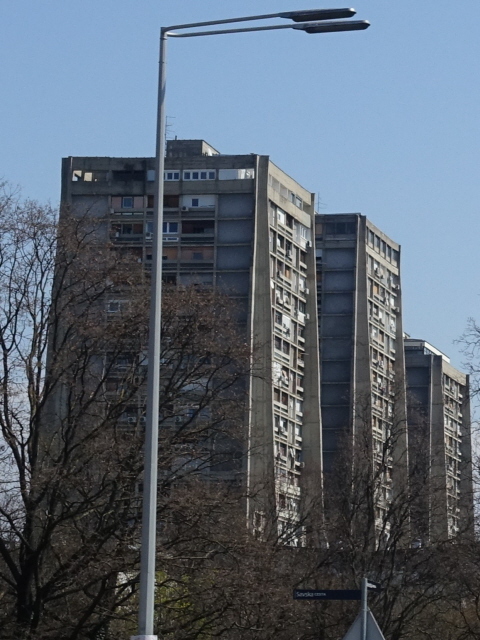 Another thing I didn't really make enough time for was exploring the modern socialist-brutalist architecture of Novi Zagreb south of the Sava River, although I did at least drive through parts of this twice, first en route to Vukovar, and then when coming back to Zagreb from Trieste. All in all I must say I quite liked Zagreb, even though it's hardly on the same scale as, say, Budapest or Prague in terms of grandness, nor as fascinatingly full of socialist-era relics as, say, Belgrade or Minsk, but it certainly has enough to keep a visitor occupied for a few days. And the Old Town is certainly very pleasant and picturesque. Location: in the centre of the northern half of Croatia, just 15 miles (25km) from the border with Slovenia, but 250 miles (400 km), as the crow flies, to the southern coastal town of Dubrovnik. Access and costs: Quite easy to get to; not as inexpensive as other parts of Croatia, but still more affordable than many other European capital cities. Details: Getting to Zagreb is easy by road, rail or plane. Zagreb has a modern international airport, but when coming from central Europe, the train may be preferable and also cheaper. You can get to Zagreb by comfortable train e.g. from Vienna in just 6 to 7 hours. Buses provide the bulk of connections, also domestically, and are quite cheap. For getting around within Zagreb, there is a decent network of trams and buses. Short rides (max. 30 minutes – which is usually plenty) cost a mere 4 HRK, longer rides 10 HRK. You can buy tickets from kiosks or directly from the driver (at least on buses – with regard to trams information varies). If you intend to use public transport a lot, an electronic ZET card may be worth considering, which can be topped-up to any amount you wish. When entering a tram or bus, hold it against the electronic machine to deduct the fare. Individual tickets have to be validated by stamping on entering a bus/tram too. Within the city centre you can probably just make do with walking. The Old Town is actually very compact, and the main city centre south of the Old Town is also relatively walkable. But if you want to head down into the modern parts like Novi Zagreb, or towards the northern suburbs (e.g. for Mirogoj Cemetery or Villa Rebar), you will need public transport. For the two guided tours with Destination Urban (see above – and also see the sponsored page for Destination Urban / Swanky-travel here), i.e. the walking tour of central Zagreb and the tour to the outskirts by van, we paid a total of just over 1100 HRK, or ca. 150 EUR. Accommodation options are plentiful and varied, from simple dirt-cheap backpacker hostels and decent and reasonably priced mid-range hotels to luxury temples such as the palatial historic Esplanade Hotel or the modern Sheraton. A highly rated hostel that also offers private rooms and apartments is the oddly named “Swanky Mint Hostel”, which is also the home of the tour operator Destination Urban / Swanky-travel, which I used for several tours both in Zagreb as well as beyond. (See here for their sponsored page). As for food & drink, you'll find plenty of restaurants serving local/regional cuisine (see under Croatia), whereas foreign/ethnic restaurants are a bit thinner on the ground here. Street food is quite the rage at the moment, and markets provide good opportunities for self-catering (in addition to the many small supermarkets/corner shops, that is). The people of Zagreb – and visitors alike it seems – love al fresco dining and imbibing, and this is nowhere more evident than on the central pedestrianized Ul. Ivana Tkalčića, which is completely lined with bars, cafés and restaurants that all have their outdoor seating areas. Time required: at least three days to cover all that's mentioned here, more to also take in all the city's non-dark attractions. Combinations with other dark destinations: If you have a car, then virtually all other dark destinations in Croatia are within a few hours drive from Zagreb, except Goli Otok perhaps, which requires a bit more time and pre-planning. Unsurprisingly, then, several destinations south of Zagreb are also covered by day return tours from the city (e.g. Željava, Petrova Gora, Jasenovac). If you're bound to public transport, things are a bit more complicated, though Vukovar or Pula are fairly easily reachable on public as well. Some destinations in neighbouring countries are equally reachable from Zagreb, e.g. Ljubljana in Slovenia, or Trieste in Italy. Train connections even make Vienna in Austria reachable in just six to seven hours. Slower (but scenic) train connections also exist to Sarajevo in Bosnia & Herzegovina to the south. Other than driving yourself or taking a train, buses provide most connections in the Balkans, also in Croatia. Combinations with non-dark destinations: Obviously, Zagreb has plenty of non-dark attractions of its own, especially the pretty Old Town, of course, and lots of museums, art galleries, parks and all that. There is no shortage of information on all this elsewhere, so there's no need to list everything here. For destinations outside the city see under Croatia in general.